Network security means more than preventing criminals and pranksters from breaking into computer networks. As a new e-book from ASSA ABLOY demonstrates, true security—including for higher education classrooms and administrative buildings—requires the use of existing network infrastructure to protect people, equipment and data. In the book, “Network Security Redefined: IP-Enabled Access Control,” ASSA ABLOY walks readers through the latest developments in access control technology, and shows how current technology can tie together such gear as card locks and sensors into a “single integrated system accessible from your Ethernet network.” The e-book also shows why legacy access systems that depend on hard-wiring discrete, non-networked components can be more expensive and inflexible than IP-enabled technology. Mission critical openings–such as perimeter entrance doors and rooms that store vital records–might be best served with a Power over Ethernet system, while low traffic opening are best for WiFi. While the network security solutions and case studies offered in the new ASSA ABLOY e-book apply to various types of buildings, higher education is an especially rich area for deployment of these technologies. That is because campuses typically include multiple buildings of varying use and security needs. This can become, in essence, a showcase for the flexibility of network security controls. Campus buildings include a mixture of old and new construction, making them a challenging environment for communication and wiring. But this challenge also opens doors to a wise return on investment if the access control solution is correctly architected, explains Jim Primovic, ASSA ABLOY’s director of campus EAC sales. Building and network administrations have two general paths to better secure their buildings, whether in higher education or elsewhere. One involves a “Power over Ethernet” configuration, which relies on the “standard LAN infrastructure to deliver power to network devices over the same cable used for network connection.” According to ASSA ABLOY, such a system uses 86 percent less energy than do traditional electromagnetic locks. The other path is WiFi, which employs 99 percent less energy. So when it comes to colleges and universities, which path is the better one? Already, Primovic says, higher education is proving to be a perfect fit for these newer approaches to security technology. The University of Southern California and Duke among the hundreds of colleges and universities using ASSA ABLOY IP-enabled solutions to boost their access control and security. “We’ve moved beyond early adopters,” Primovic says. “Security is on everyone’s radar.” Strengthening access control makes obvious sense for schools located in urban centers, where officials strive to push better security as deep as possible into buildings. But even rural institutions want stronger security perimeters, he said, underscoring the appeal of the technology. The ASSA ABLOY e-book on network security and access control provides a checklist about what installation—Power over Ethernet or WiFi—best suits particular uses. 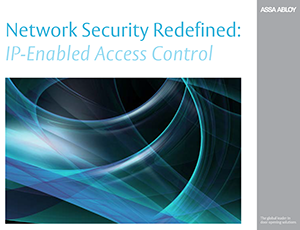 Check out the new eBook, “Network Security Redefined: IP-Enabled Access Control,” and contact an ASSA ABLOY campus security expert for assistance creating your security plan.